Mr Dallal journeys to remote areas frequently to portray the splendour of rarely seen landscapes and capture the beauty of unity between man and horse. His diverse subjects range from nomadic tribes of the Turkmen Steppes to the Household Cavalry in Knightsbridge. 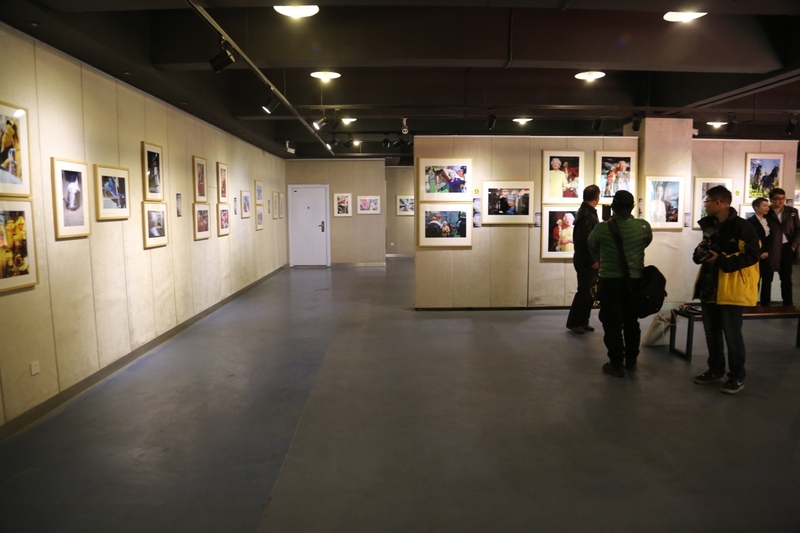 His work has been exhibited and featured in publications internationally. His commissions include photographing Her Majesty The Queen and several other ruling families of the world. 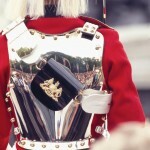 Mr. Dallal will be focusing on the Household Cavalry and related subjects taken over an 18 year period. He will be presenting a selection of his work from his travels and his other books prior to the show including retracing the footsteps of Lawrence of Arabia and speaking at the UNFCCC Climate Change conference in Lima, New York and Paris during COP21 for the Paris agreement. 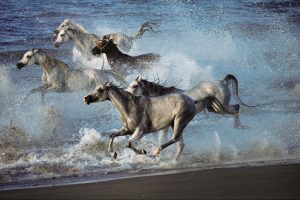 I was born in Iran in 1955, and my love of horses and photography is due to my parents. My mother took me horse riding at the age of nine, and my father gave me a box Brownie then, too. It’s a wonderful old film camera, very basic. My father was always taking pictures, so I thought it was a normal thing to do. After studying marketing at univer­sity in Colorado, in the United States, I returned to Iran to join my father’s import and export business. But then the 1979 revolution happened, so we ran away to England, where I sold my first photo in 1980. After two years, I moved back to Colorado. I returned to London in 1994 and have not left since. 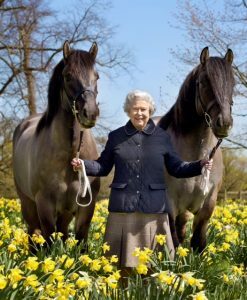 One day, I got lucky: I saw the Household Cavalry (the queen’s official bodyguard) in Knightsbridge, and I was invited to ride one of the horses – every morning they invite a few civilians to ride. After that, I started taking pictures of the cavalry all the time until I became invisible to them. I had no idea I would end up making a book about them. It was fascinating for me to see the colours, the horses, the uniforms. In 1999, I was invited to exhibit my work at Kensington Palace. I was involved in the property investment business and it suddenly occurred to me, why wait to retire to go and photograph a remote tribe somewhere? The tribe I’m looking for is right here, next door to me in London. 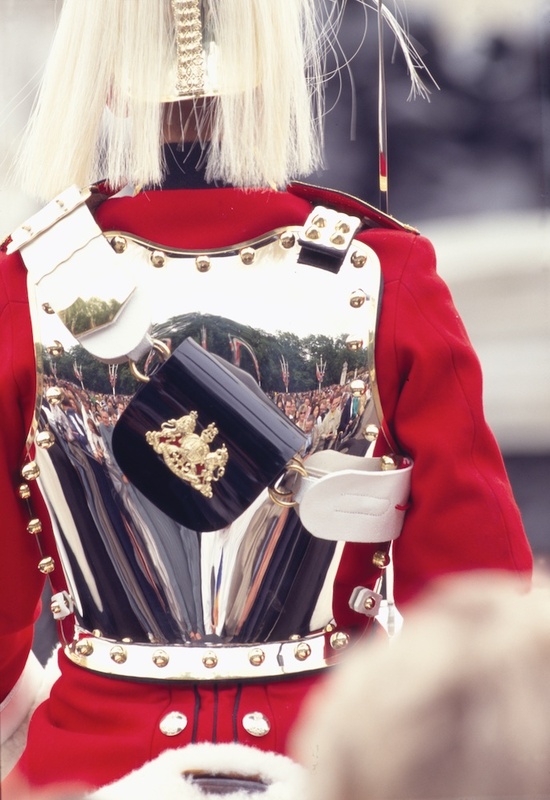 For my 2003 book, Pageantry & Performance, I wanted to record everything the Household Cavalry does. I spent six years embedded with them. The public never sees how hard they work behind the scenes, they only see a parade once a year. There’s a history, a tradition that goes back 350 years. The commander of the cavalry – the boss – is Her Majesty the Queen. It’s very symbolic. But her personal passion is horse racing. She owns racehorses and she rides her horses all the time, still. She knew that I like horses, too, so I was invited to meet her in 2001, and to do her portrait for her golden jubilee (in 2002). I’ve been very honoured since: my latest portrait of her is the official portrait for her 90th birthday in 2016. I found a sea of daisies for the foreground, and we had Her Majesty with her horses. You need to get the horses ears right, so I had some­body behind me doing jumping jacks, making fun of me. The queen laughed because she found that funny, but it was really to make their ears stand up. 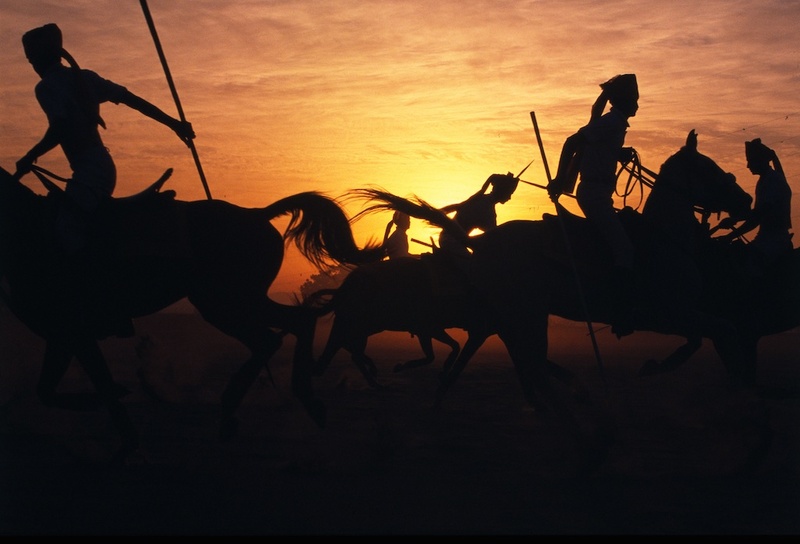 Desert Pageantry: The Royal Cavalry of Oman was all shot on film. That book took me about eight years. I printed it in 2013. They have 1,200 horses. 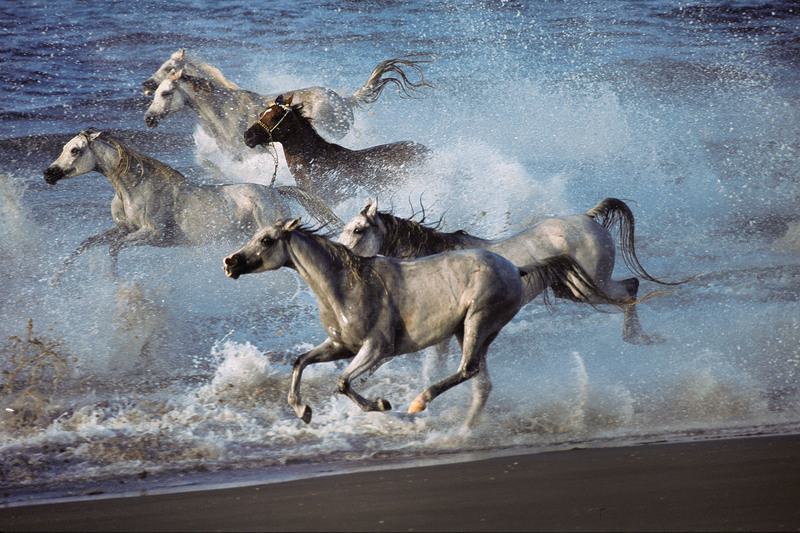 It took me a long time to get the Galloping Greys picture, which I shot in Seeb, Oman, in 2011. I’m still not happy with it. I had this vision of horses galloping wild, but to create it was difficult. It’s only at the moment of release that you get this explosion of action but it had to be safe for the horses. I went to the top general, and he said, “No, you’re not allowed to do that. It’s impossible.” So I went to the sergeant in charge of the stables. He said, “Sure, no problem.” We took 20 horses about 4km out, and we did it. The problem was that the light was not right. So the next morning, I go again – and this time the general comes to watch. We take 30 horses 5km out. They release the horses, and I’m there, waiting for them to run this way, but they don’t. They wait, and then they start running the other way – to town. I’ve got the general there with me, and I’m thinking, “Oh my God, these 30 royal, purebred Arab horses are going to run wild into town. They are all going to die.” Fortunately the tide was up so they couldn’t go much further. That wasn’t my most challenging shoot. In 2006, I was asked to do some official portraits of the queen and Princess Anne and some top generals for the museum of the Household Cavalry. Put me in front of 100 horses gallop­ing towards me – no problem. But this was inside, I had to use lighting, it was staged and each subject had to have a painting behind them. I wondered, “How do I make it interesting?” I had to go into Buckingham Palace, find a room, choose the right painting – for the queen it was her great, great grand­father, King George III – and bring the right lighting. You have to think about these things, you have to plan. To me, the art of portrait photography is to be able to take a single picture that tells the story of the life of that person. You have to forget about how famous or powerful a person is. You become just two people talking, and you take a picture. 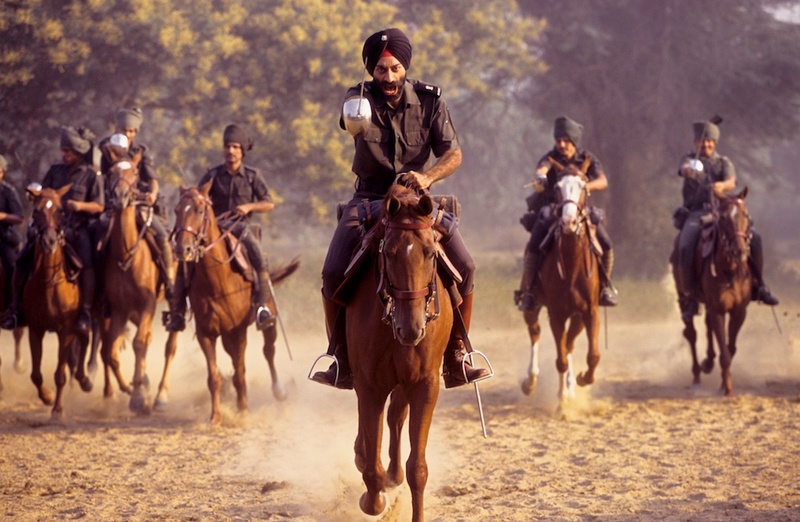 In 2007, I was invited to photograph and create a book on the 61st Cavalry in Rajasthan, India. 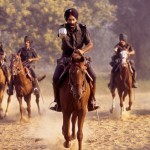 The Indian cavalry have a charge, and they bring out their swords, and they gallop like they used to do in days of old. I thought it’d be nice to capture that. That was pretty stupid, actually. A horse, as long as you don’t move, will not run right into you, it will go around you. I realised, though, that one of the horses could push another one to the side a little bit, and I’d be a target – a simple miscalculation. I did one try, and that was it. I don’t want to be a slave to the camera; I want the camera to be a slave to me. I like to have experiences, and then take pictures of those experiences. I try to take the mini­mal amount of equipment possible. Most of my cameras have to tolerate riding on the back of a horse, being thrown on the floor of a jeep, going over rough roads or being in the sand. Not every picture’s perfect; sometimes I make a mistake, but sometimes the mistake looks perfect, because it’s creative. You have to know your subject, to anticipate what’s going to happen. Each discipline has its perfect moment, the height of the action. But there’s one more element, and that’s luck. Every time I’ve received a “no”, seemingly reached a dead end, somehow I’ve ended up in a better position, in a better location, at a better moment. Henry Dallal was in town to give a talk titled “The Nobility of Equine Pageantry”, organised by the Royal Geographical Society at the Hong Kong Club, 1 Jackson Road, Central. The Royal Geographical Society is delighted to welcome Henry Dallal to speak on “The Nobility of Equine Pageantry”. In this lecture, celebrated Royal and horse photographer Henry Dallal shows some of his most famous photographs and tells of the photographs he has taken of Royalty, world leaders and cavalry regiments worldwide. This includes a multimedia show. 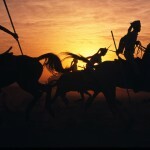 The talk ranges from the House of Windsor, to the 1,300 strong Royal Cavalry of Oman to the Horse Warriors of Rajasthan. Mr Dallal talks of his 17 years of photographing equine pageantry in Britain and some 20 other countries. This includes when the regiments of 25 countries came to Windsor Great Park for the HM the Queen’s Diamond Jubilee and his travels to photograph horses around the world. He also speaks of horse racing, including Royal Ascot, and of retracing the footsteps of Lawrence of Arabia on horseback. He also recounts his appearances to speak at the UNFCCC Climate Change conference in Lima, and also in New York during the UN General Assembly Meeting for Climate Week. London-based Royal photographer Henry Dallal hails from Iran and moved to the United Kingdom following the fall of the Shah. He is photographer to numerous Royal Families worldwide and one of the world’s most famous equestrian photographers. He is most famous for his work for the Royal Families of Britain, Dubai and Bahrain, plus of the Cavalry Regiments of the United Kingdom, the UAE, Bahrain, Pakistan and India, but has photographed the horses & mounted regiments of more than 20 counties. Mr Dallal has published a number of coffee-table books including “Desert Pageantry, The Royal Cavalry of Oman”, “Pageantry and Performance, The Household Cavalry in a Celebration of Pictures”, “Horse Warriors, India’s 61st Cavalry”; “Addressing Climate Change; The World Met In Paris”, “The World Came to Windsor: The Diamond Jubilee Pageant” and “The Queen’s 90th Birthday Celebration, Windsor Castle”. He has also contributed to numerous other books including “Qatar: Sand, Sea and Sky”, “Endurance, Magic of Monaco”, “Horse Gunners: The King’s Troop Royal Horse Artillery” and “Horses”. 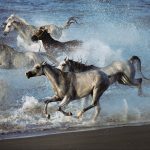 Mr Dallal journeys to remote areas frequently to portray the splendour of rarely seen landscapes and to capture the beauty of unity between man and horse. His diverse subjects range from the nomadic tribes of the Turkman Steppes to the Household Cavalry in Knightsbridge. His work has been exhibited worldwide and featured in publications internationally. He has been honoured with numerous commissions to photograph Her Majesty Queen Elizabeth II and other senior world figures. He is a keen rider, mountaineer, traveller, adventurer and climate change activist. Members of the RGS, their guests and others are most welcome to attend this event, which is HK$150 for RGS Members and HK$200 for guests and others.